This is the first time I wrote a review and had to chuck it all and start over again. In the beginning I didn't like this game. As a matter of a fact, I was looking to get out of writing the review. Some of it might have been snobbishness. After all, this is a game that started out as an IPAD game. I have never liked any IPAD/Android game that I have tried. They all seemed to be missing something. So when I started to play GTTT, I was looking at it through less than rose colored glasses. Even parts of it that should have felt good to me I disliked. 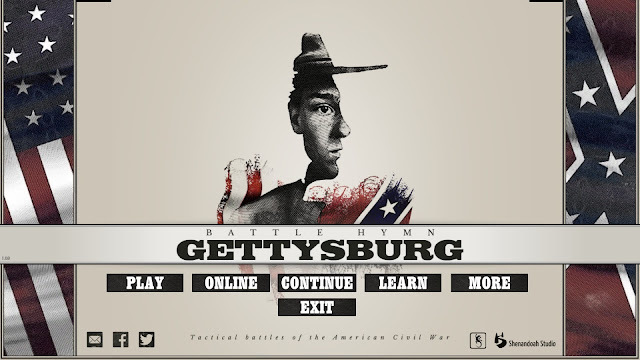 Chit pulling for a game has been used for a long time to represent the vagaries and 'friction' of war. You have all these troops, but cannot use any of them this turn due to luck, and sometimes useless commanders. At first, when playing this game, it seemed maddening. I couldn't come up with a coherent plan, or at times save some of my forces from certain destruction. I was just about to give up on it when I started it up for one more try. I had just had a very good day at an Air museum and was in a unusually good mood. So I thought, what the heck let's give it one more try. I think I have mentioned before that sometimes it takes a while for a game to 'click' with me. I will go through the motions, but never really get absorbed in it, and just daydream between, and sometimes during, turns. So now I am happy to report that GTTT does have a method to its madness. It just took a much longer time than I am used to for me to 'get' this game. As you can see the game comes with five scenarios, and a campaign game that can be played from either side North or South. The game does not actually have Fog Of War implemented as we are used to. You can see all of your opponents forces just like with a boardgame. In this case I am using the term Fog Of War to represent the fact that due to the chit pulling you have absolutely no say in what your forces can or cannot do for this turn. At times this a bit nerve racking and destroys all of your well made plans you made last turn. Because of this mechanic it is almost like every turn is a completely new game, and in some ways it is. 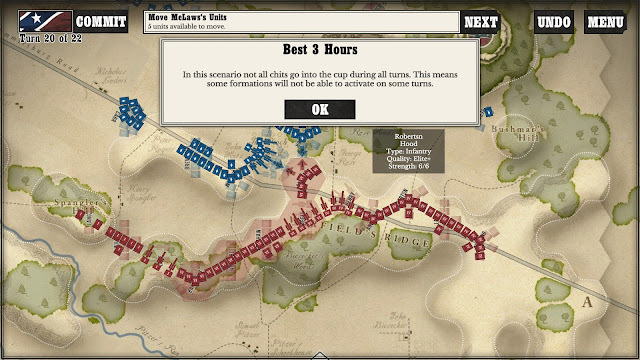 The map has to be one of the best looking Gettysburg maps I have ever seen on a computer. 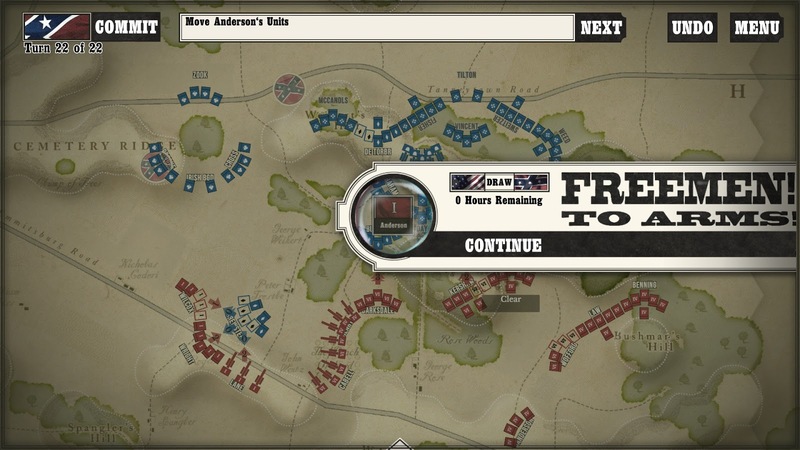 The terrain is well marked, and that helps immensely with planning your moves. 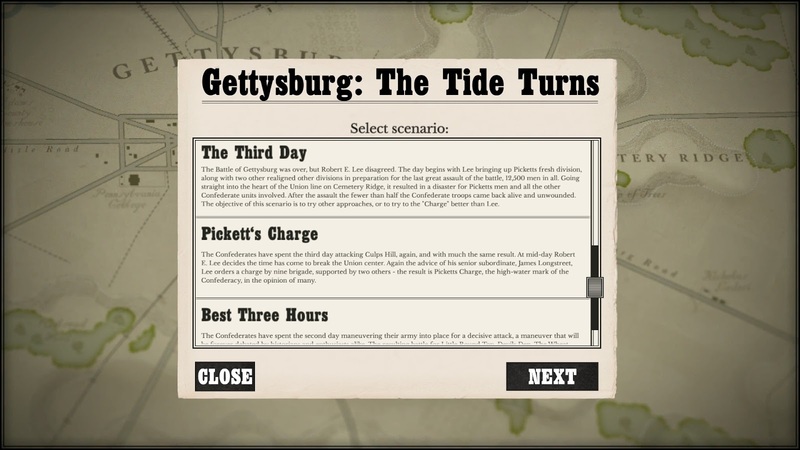 With the chit draw process the game uses you will never know what, if anything, you can do on your next turn. So, as far as Fog Of War there is plenty to go around. The AI is brutal, simply brutal. It will attack and find your weaknesses. It might be too offensively minded for someone who is used to a Union computer side that plays like Meade. Some games' AIs are programmed to do one thing every game, or at least if the opponent does 'X', the AI does 'Y'. This is not the case with GTTT. The AI seems to react well to your different moves and strategies. 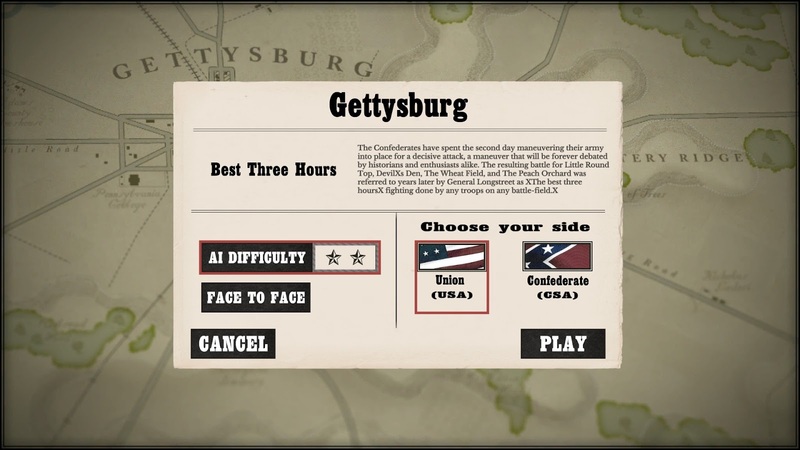 The game has three different levels of difficulty. 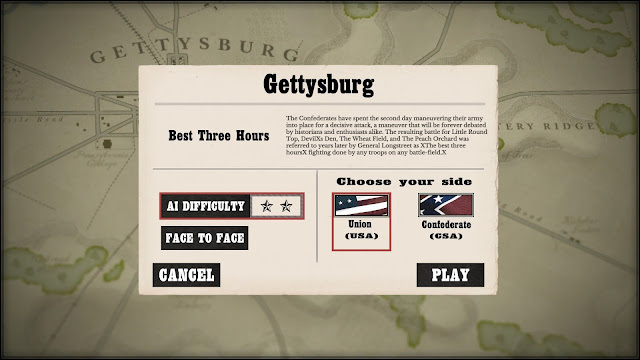 From reading on the forum from the developers the higher the level of difficulty just means how strong your opponents forces will be. then it will Heal a single demoralised SP at the end of the turn. During the full campaign game, there are a number of Night Turns. commanders during the night hours." These rules, among others, along with the amount of scenarios, and the low price ($9.99) make it a easy for me to endorse the game now. Just take my advice, and before you hit the uninstall or refund button, give this game one more play through. I think you will be glad you did. 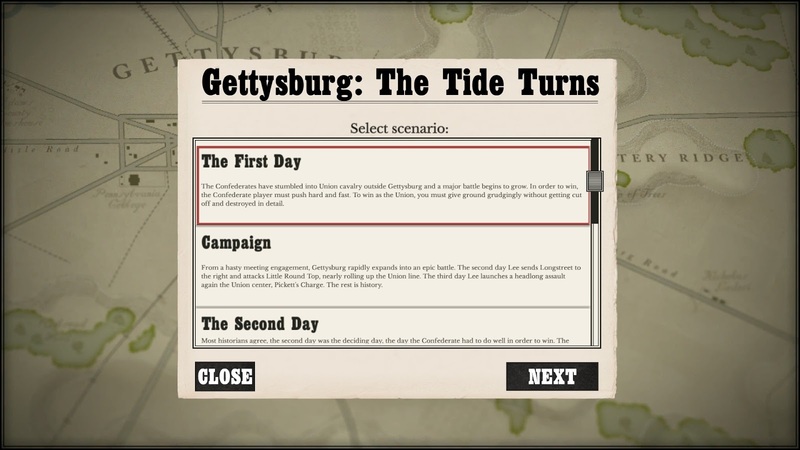 with bug I came across, that froze the game on the 11th turn of the campaign, which hopefully will be fixed asap, I still recommend it too. yes the game can freeze up but I founf that if you go to the main game page then continue the game it would continue normally.